^ Quickfacts.census.gov - Christian County - accessed 2011-12-06. 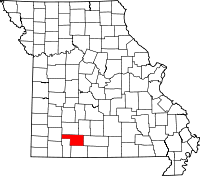 ^ Quickfacts.census.gov - Ozark, Missouri - accessed 2011-12-06. ^ Quickfacts.census.gov - Nixa, Missouri - accessed 2011-12-06.